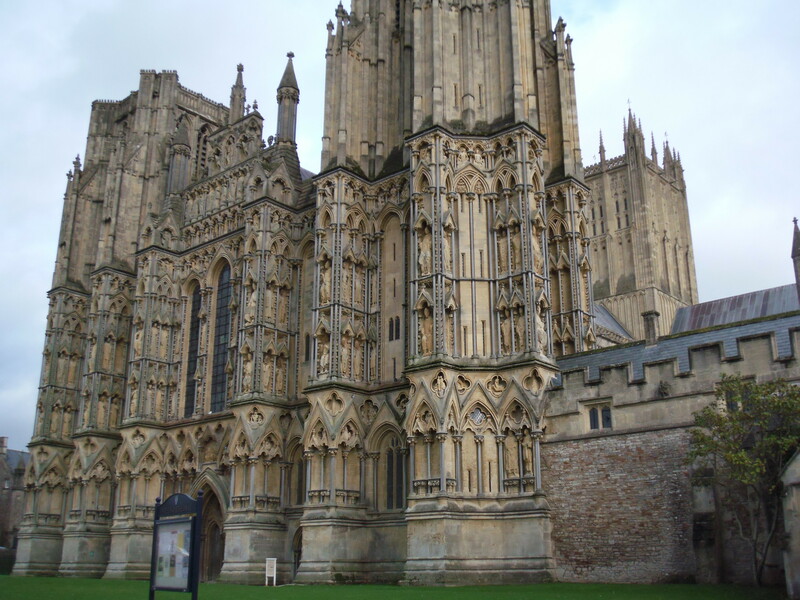 Not far from Bath, and definitely worth a visit if you’re in the area, is the magnificent Wells Cathedral. 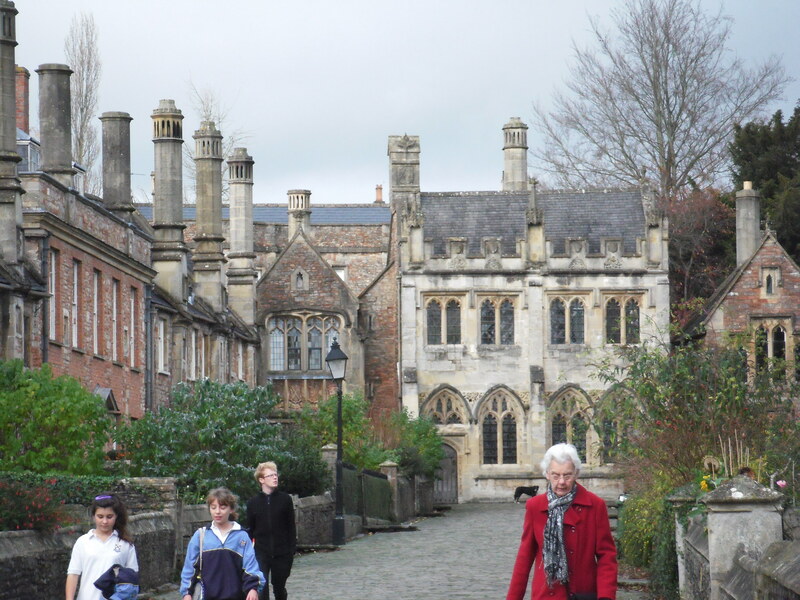 From its intricate facade covered with statues in niches and ornately carved stone decorations to the unique architectural features of its interior, Wells is full of delightful surprises. 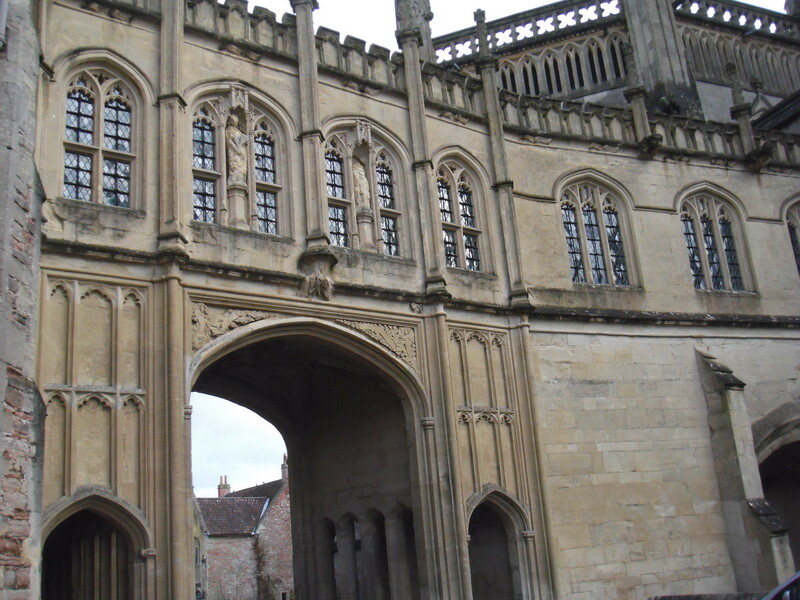 The scissors-shaped arches in the crossing are probably the most famous of the innovations at Wells. 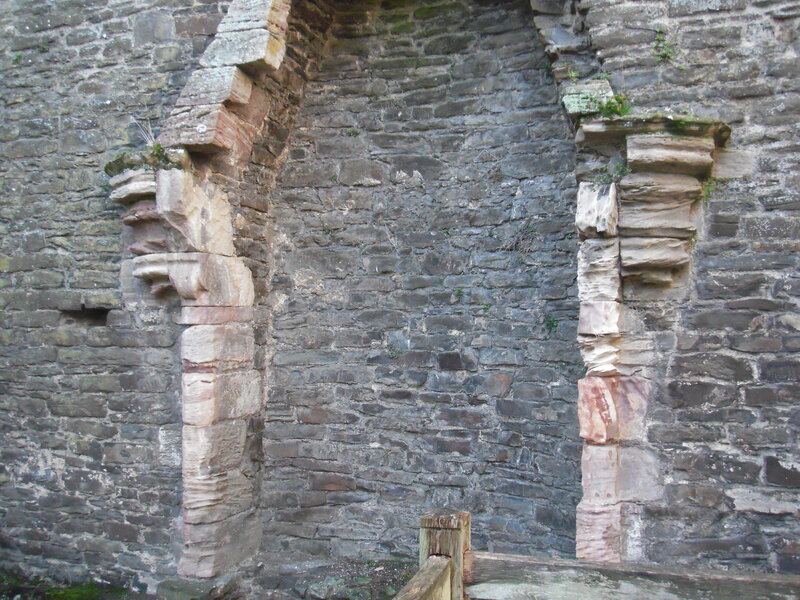 Designed in the middle ages to allay the danger of collapsing walls, the reinforcing double arch is repeated on each of the four sides of the crossing. 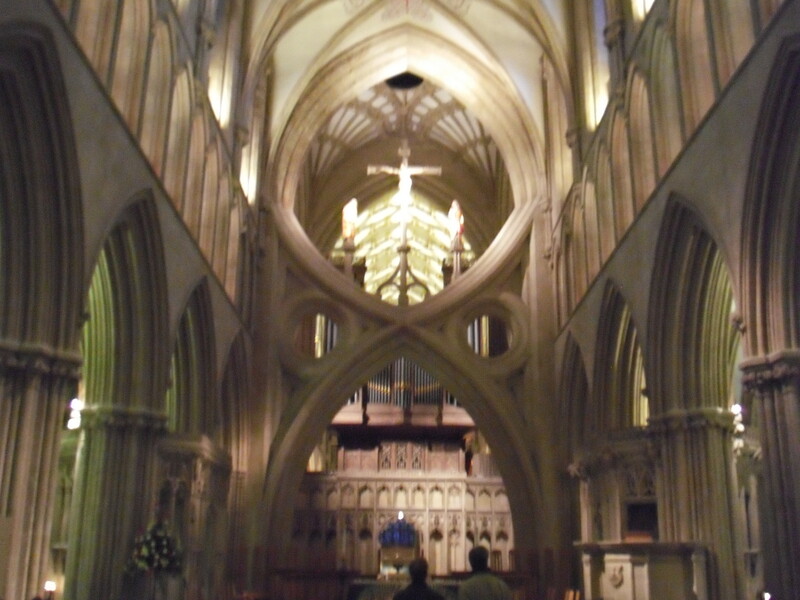 There’s something similar at Salisbury Cathedral, but at Wells they’re larger and the effect is much more dramatic. 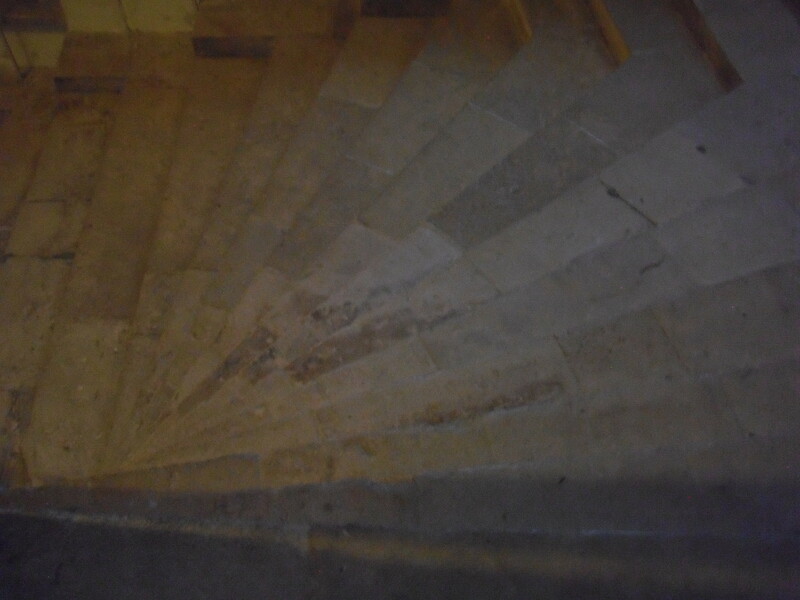 Perhaps more subtle, but even more enthralling to me, were the stairs leading up to the chapter house. It’s hard to get a good angle to photograph them, but, the way they curve with a sharp angle at the wide end toward the top is just beautiful. The way they’re worn down so deeply also appeals to my imagination, summoning images of the passing centuries of cowled monks and bejewled kings and parasol-carrying Victorian tourists. 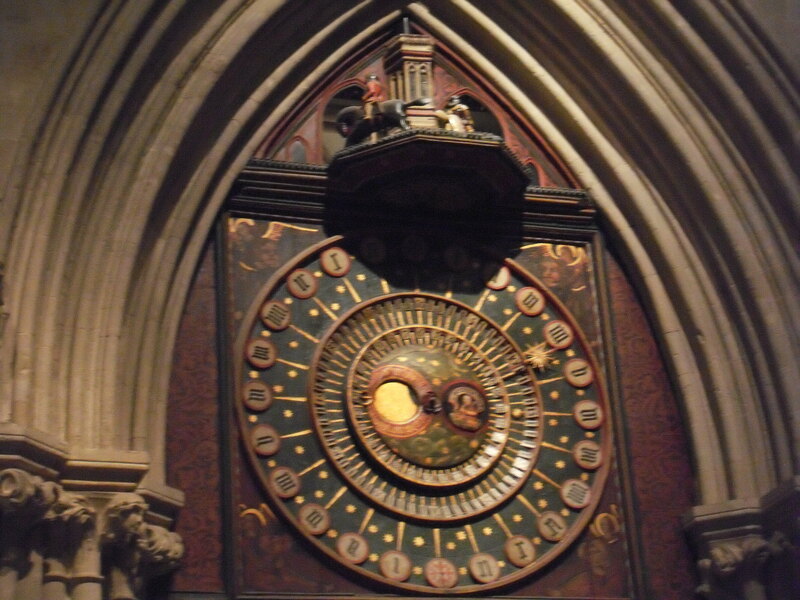 My favorite non-architectural feature was the clock in the north transept, which dates from the 14th or 15th century. Its mechanized knights joust on every quarter hour, galloping around in a circle and knocking each other backward with their lances. I could have sat and watched them forever, but after a few circulations they run down and stop, as clockworks will do… and there was too much else to see to wait for the next quarter hour to come around. One thing that makes Wells Cathedral feel more impressive than some others is its setting – at the end of a wide open green, with the Vicar’s Close to one side. Reached by an over-street bridge from the chapter house, Vicar’s Close was built in the early 1400s and besides the addition of chimneys and other modernizations, hasn’t changed much since. It’s the oldest continually inhabited neighborhood in England. Also nearby is the castle-like Bishop’s Palace. It wasn’t open to the public (it closes for the winter) but there were some people working on the grounds who let me sneak into the courtyard for a few pictures. For some reason, Wells wasn’t even on my radar until the landlady at my bed and breakfast in Bath suggested it. 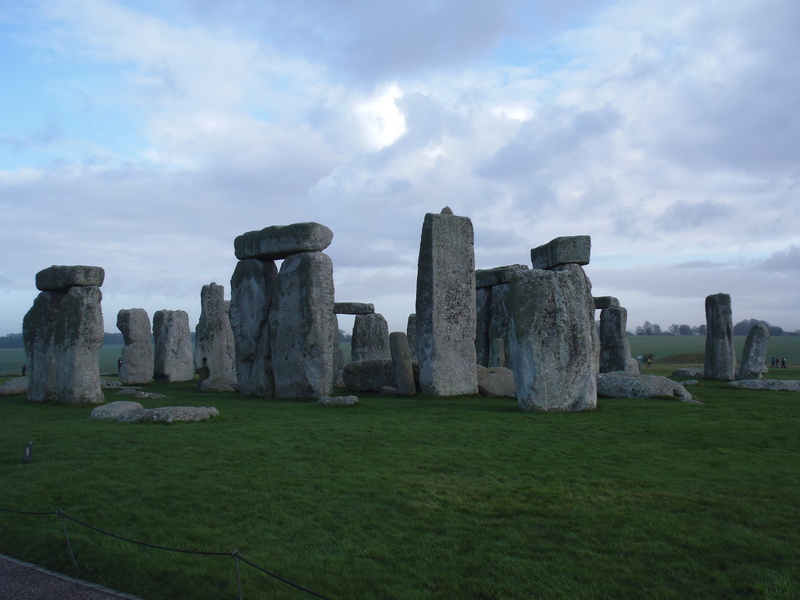 But it turned out to be one of my favorite places in England. 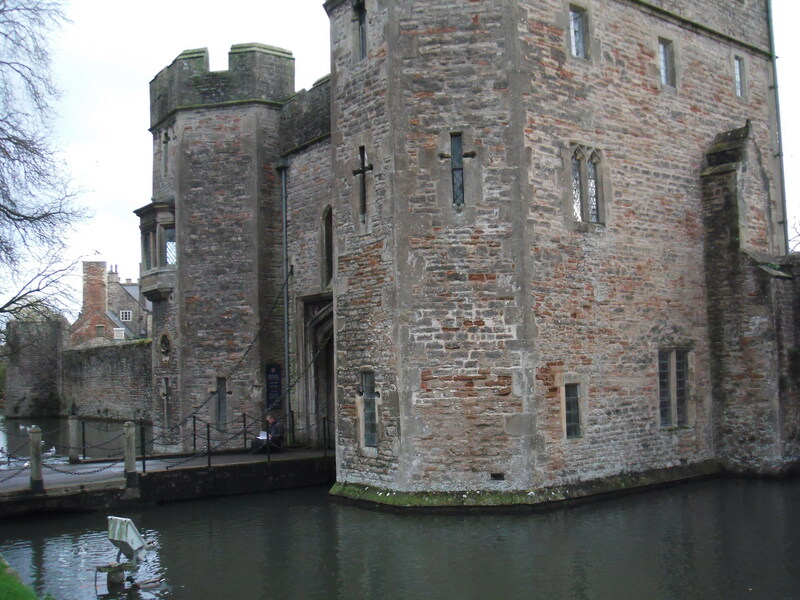 Wells – it’s well worth a visit! 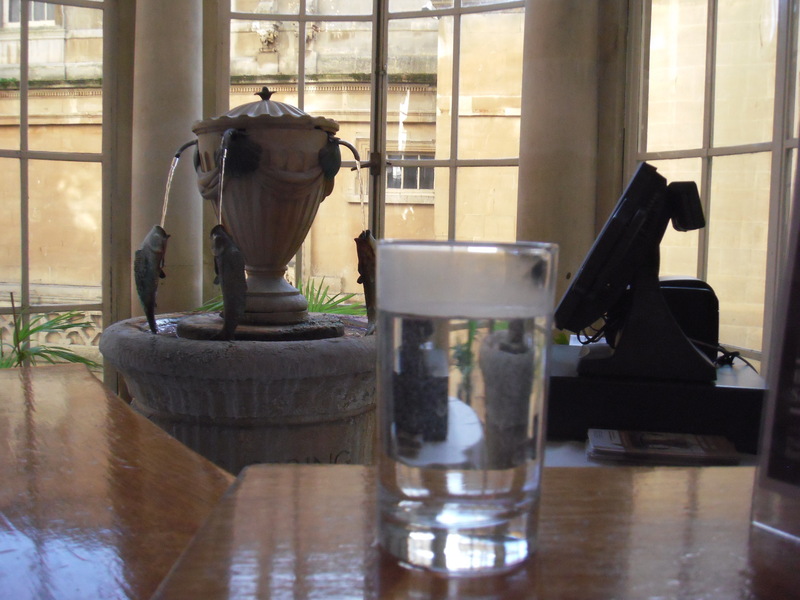 For centuries, people visited Bath not just to bathe but to “take the waters,” which is to say, to drink them. With natural hot springs pumping hundreds of gallons of 46-degree-Celsius mineral water up to the earth’s surface every day here, there’s plenty available, and a free glass is included in a ticket to the Roman Baths Museum (a fascinating and well-constructed place to visit in itself, even without the enticement of free Bath water). The glass is served in the Pump Room, and it’s a good excuse to sneak inside this enclave of the upper crust. 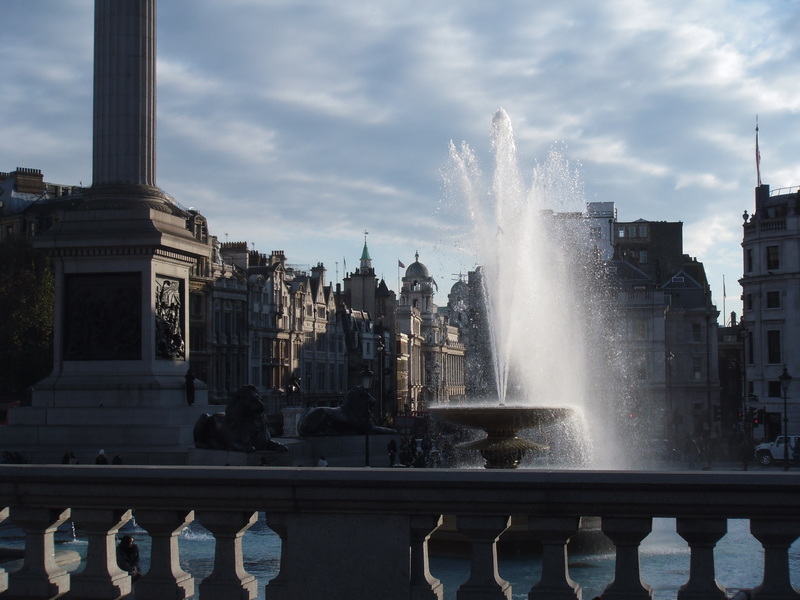 The Pump Room is where the 18th century elite would gather to take the waters after spending their mornings being immersed in the pools and wrapped in hot towels. 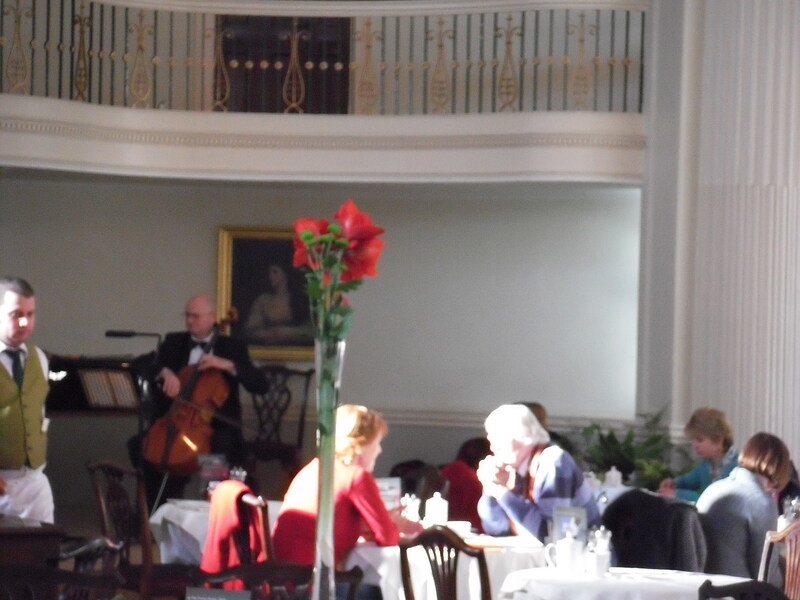 Today it’s a beautiful restaurant where live classical music serenades the morning coffee and lunch crowds, as well as those of us mortals who just want our free spring water after touring the museum. The water is served warm and has a definite odor of sulfur and fish. At first taste, though, it’s not noticeably unpleasant. Making it through the entire glass is another matter. I had to knock back the last couple of inches to get it over with, and the girls who came in before me left their glasses behind still nearly full. I had the taste of the water in the back of my mouth all day – nothing got rid of it. 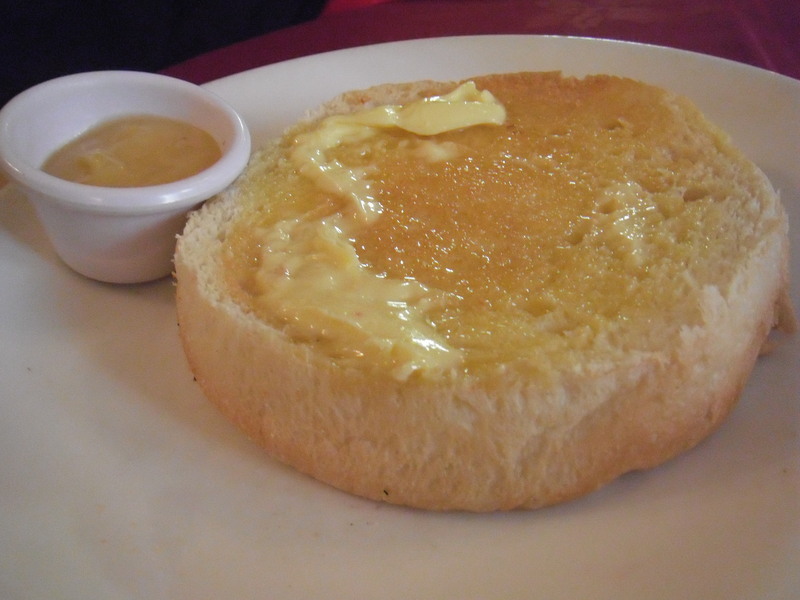 Another famous restaurant in Bath is Sally Lunn’s, where the Sally Lunn bun was supposedly first baked by a 17th century Huguenot refugee from France. Almost everything on the menu, whether sweet or savory, involves the bun in some form. I ordered soup, accompanied by half of the top half of a Sally Lunn, which had a dark brown rounded crust, as well as a lemon curd bun, which turned out to be the flat and pale bottom half. The interior of both halves was extremely light, to the point of having no taste or texture at all. It made a great vehicle for lemon curd, but I was a bit disappointed – I was expecting something more like Japanese milk-pan, or at least brioche. 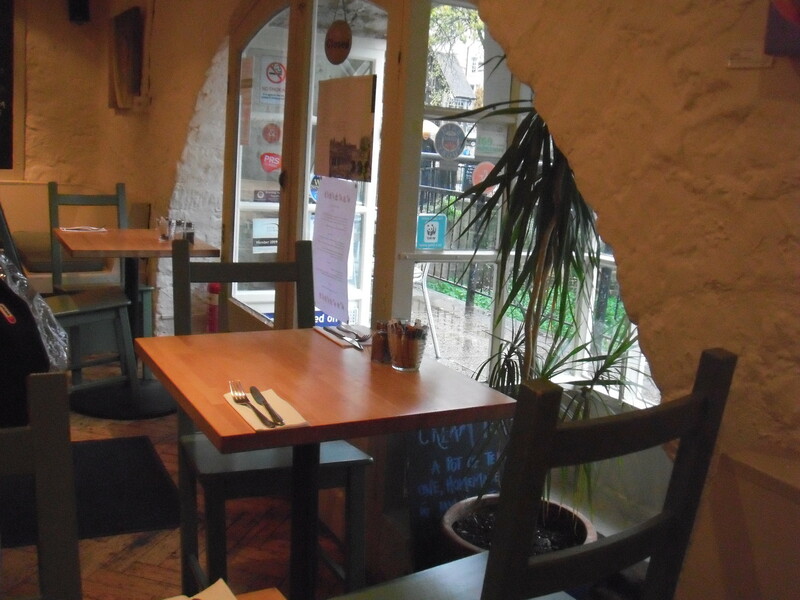 The restaurant is located in the oldest house in Bath, and the timber beams are fully in evidence. There’s also a kitchen history museum in the basement. It was extremely crowded when I was there between one and two in the afternoon, and I had to wait a long time both to be seated and to be served. Not at all crowded, though cheerfully busy and cozy in its little space beneath Pulteney Bridge, the Riverside Cafe is a much better place to take a break from sightseeing. The menu is light and modern, with choices like enchiladas and hummus as well as traditional English breakfasts and fish and chips. The brick walls are painted white and decorated with large, colorful close-up photos of flowers, the cushions on the benches are leaf green, and there are a few potted plants inside as well as the river just outside the window. 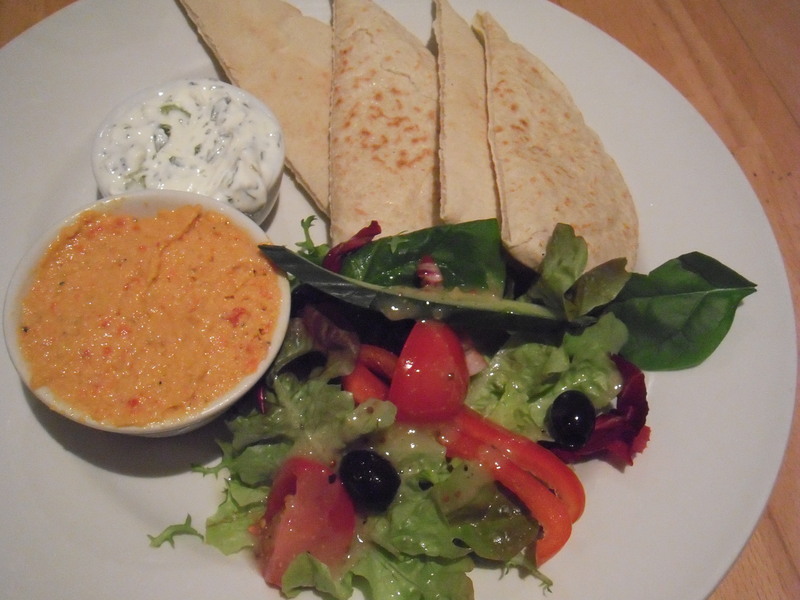 I had the red pepper hummus, which came with a salad, a warm pita, and herbed yogurt, and it was all very tasty. The Cake Cafe, in the new shopping area near the railway station, has a window full of towering gateaux that caught my eye from the very first afternoon I was in Bath. There are shorter cheesecakes and sponge cakes available as well, but it was the mousse-filled layer cakes that really looked delicious to me. 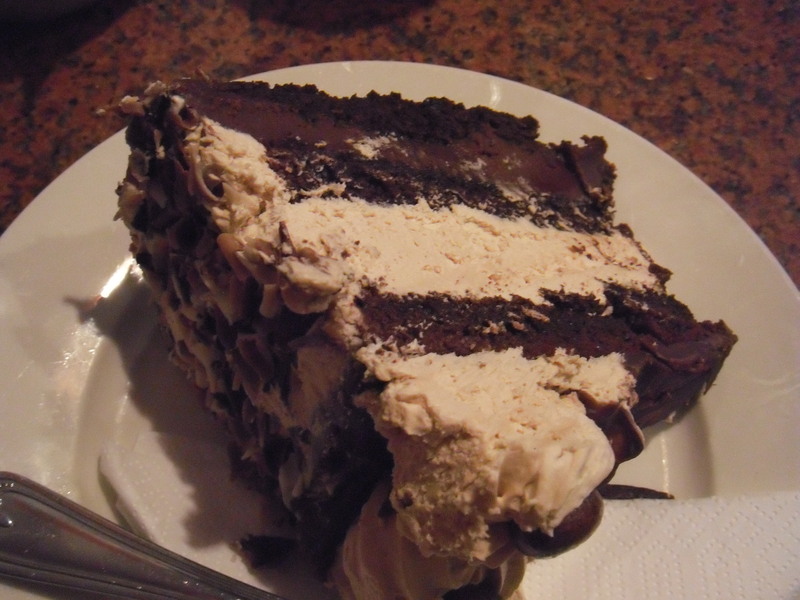 I got the last slice of a chocolate-coffee-caramel combination that took me half an hour to eat and eliminated any need to have dinner that day, but was really delicious. I only just learned when I looked up the address to post here that this isn’t a chain but an independent, local shop – all the more excuse to indulge. 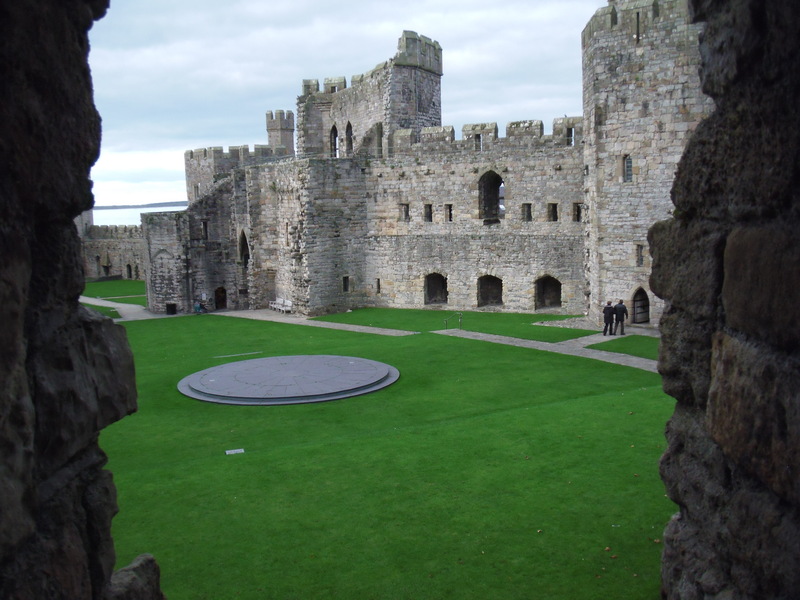 Even though it was never completed, Caernarfon Castle is still very impressive. 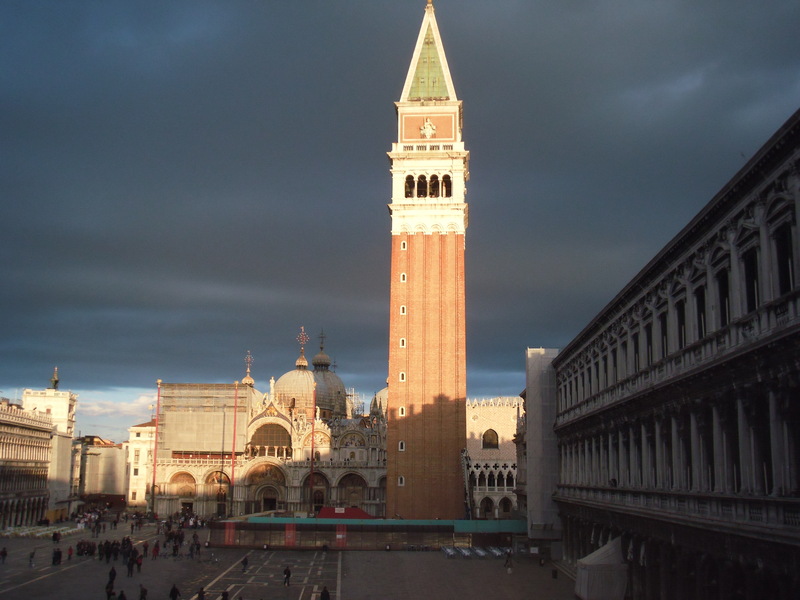 Its octagonal towers and walls striped in different colors of stone were based on the famous walls of Constantinople, and the turrets topped with carved eagles were meant to invoke the imperial power of Rome. Built on solid rock at the edge of the Menai Bay and with the walled town providing an extra layer of protection against land-based attack, it’s a well-defended fortress indeed. 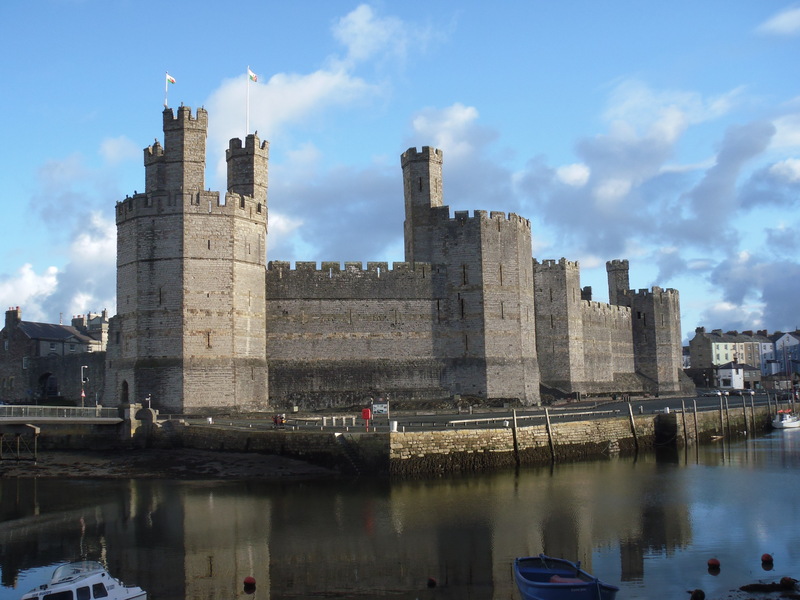 King Edward II was born here in Caernarfon, either in temporary quarters during the castle’s construction or else (as legend has it) in the Eagle Tower. Legend also has it that Edward I presented his newborn son to the Welsh people in fulfilment of his promise to provide them a prince who was born in Wales and spoke no word of English (or of any other language, either, being newly born). Edward II wasn’t officially named Prince of Wales until he was much older, but ever since it’s been the honorary title given to the monarch’s oldest son. Prince Charles was named Prince of Wales right here at Caernarfon Castle in the 1960s, kneeling before the queen on the circle of slate that was put in for the occasion. 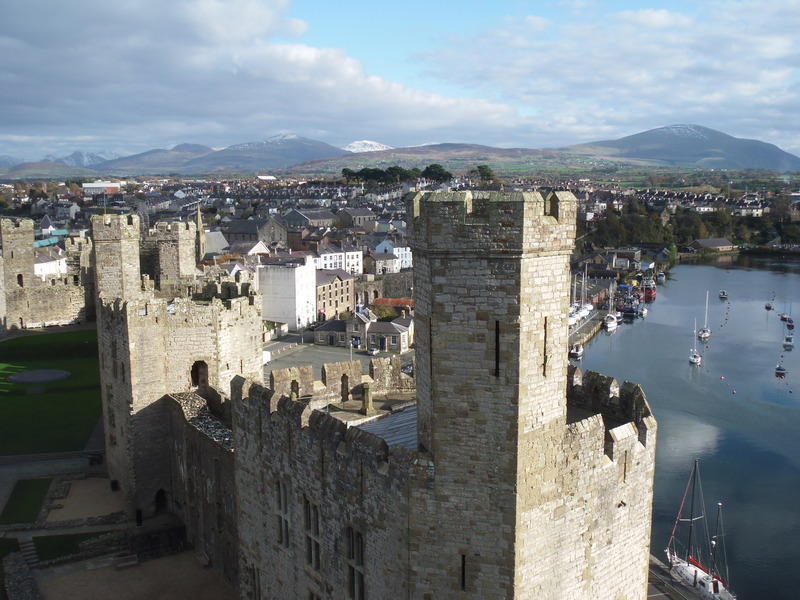 Like Conwy Castle, Caernarfon was meant to have an inner and outer ward divided by a wall that would give added protection to the seaward royal quarters. The dividing wall was never built, though stone toothing was left to give it an anchor on the outer walls, and today the castle’s interior is one long green lawn stretching from the never-finished Queen’s Gate past the King’s Gate in the center all the way to the three-turreted Eagle Tower at the end. Nearly all the towers have been stabilized and fitted with modern spiral staircases so that visitors can climb them, either part way up to explore the walls’ internal passageways, a little higher to come out at the wall walks, or all the way to the tops of the towers and a few steps higher to the tops of the turrets. It’s a long climb, but well worth it for the splendid views of the surrounding countryside, snow capped Snowdonia mountains, and the bay. Now this is a proper castle! 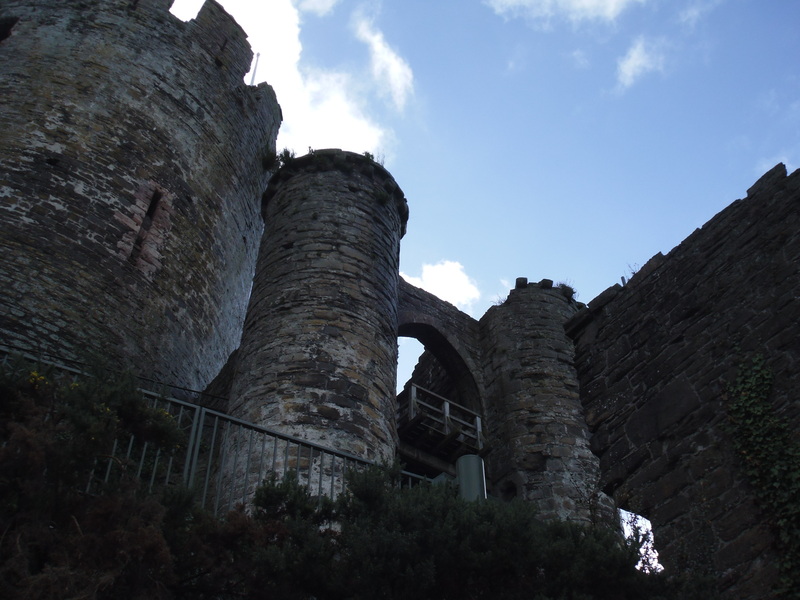 Conwy is the only Welsh castle I visited that was actually completed in the 14th century (or ever), and it provides the best glimpse of medieval castle life that I’ve yet seen. Its towering turrets, masonry frills, and of course countless arrow loops and murder slots are all iconic castle material. 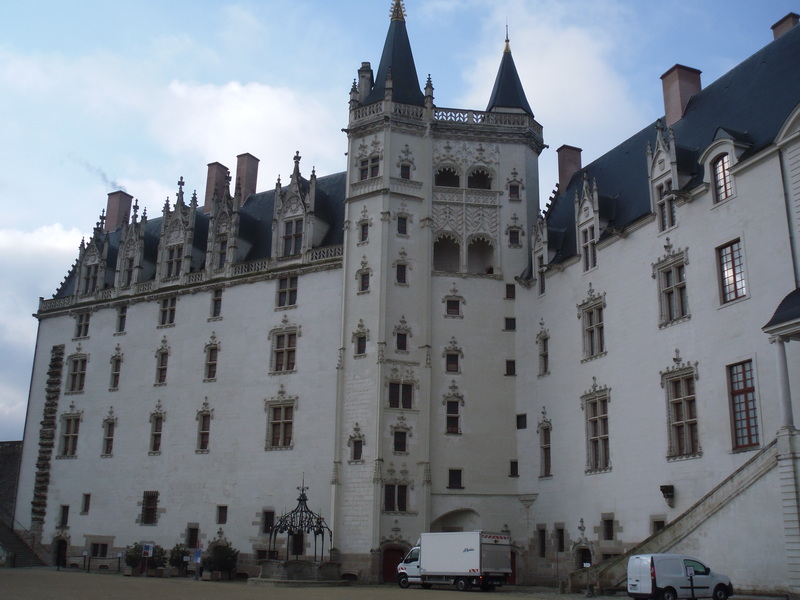 What’s more, the interior walls and foundations that remain intact, along with the remnants of fireplaces, windows, and latrines, make it easy for the imagination to fill in the wooden stables and great hall, to furnish them with tapestries and dark wood furniture, and to populate them with crowds of mail-clad knights and other Chaucerian characters – not to mention the real people who experienced dramatic events within these very walls. 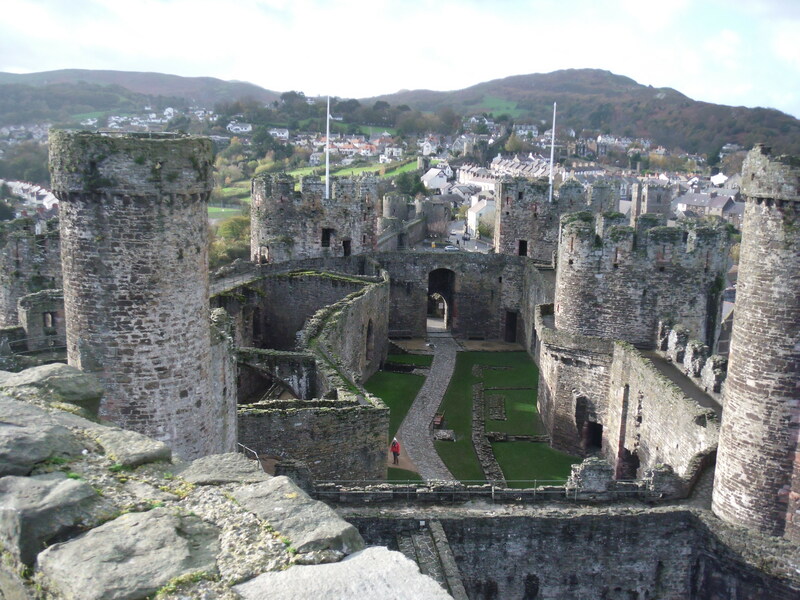 Conwy Castle is built with an outer ward on the west end, where the Great Hall, stables, and administrative buildings would have been, and a more protected inner ward on the east end, with the king’s and queen’s chambers, granary, stockhouse, and garden above the sea gate. 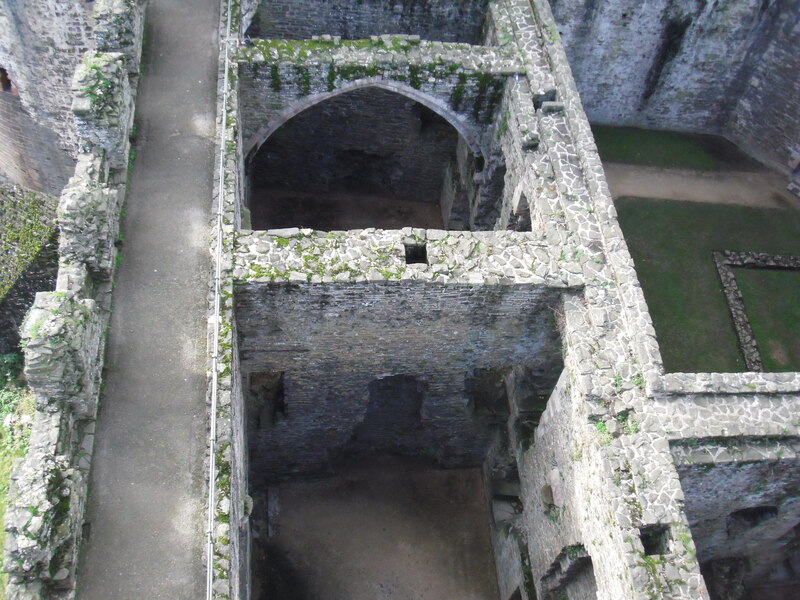 The photo above, taken from the top of one of the eastern towers, gives a good aerial view of the outer ward. 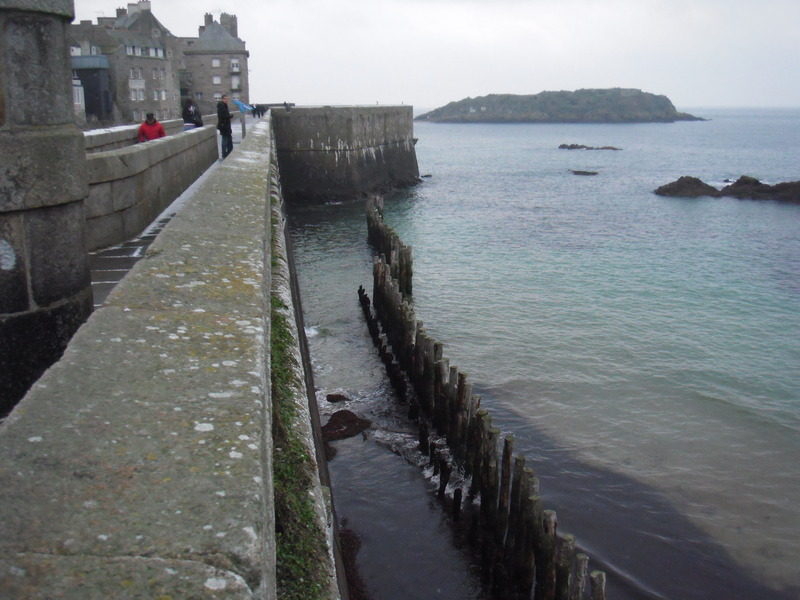 The walls on the left would have contained the Great Hall and a chapel, while the foundations on the right could have supported a variety of outbuildings for use by servants or the town’s administration. The photos above show details of the Great Hall: the tracery in the windows, and the red sandstone masonry around the great fireplace. The Great Hall also has deep windows with seats, masonry arches to support the roof, a cellar below, and a chapel at the east end. The prison tower is right beside it, which I find kind of chilling. Here’s an aerial view of the inner ward, with the king’s chambers at left and the courtyard, with the foundations of the granary at right. 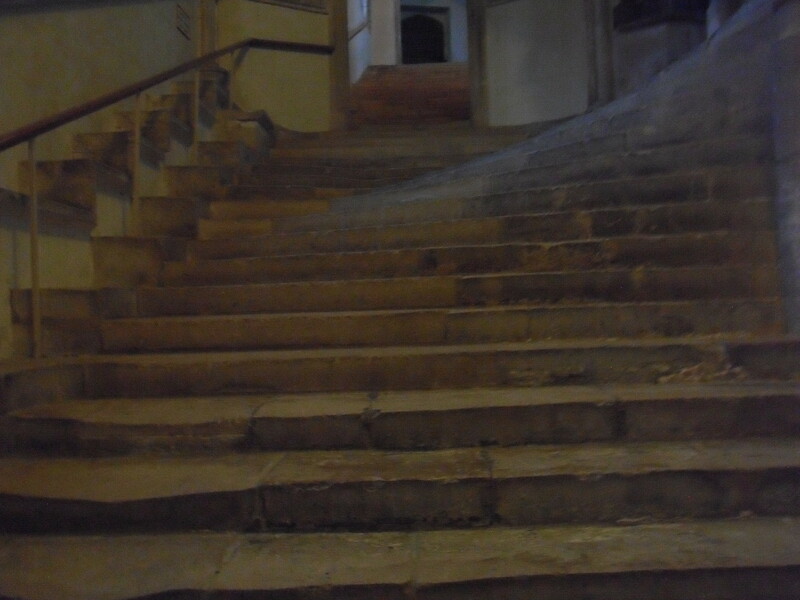 Across from the king’s chambers was the king’s presence chamber for receiving visitors, and just up a straight flight of steps from it is the royal chapel. 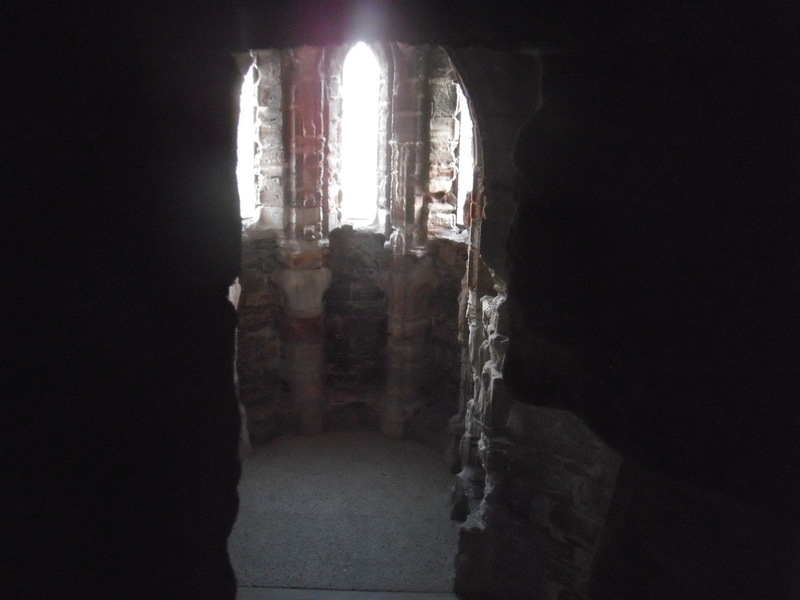 The king had a small watching chamber hidden away above the chapel, where he could sit apart from the other congregants but still observe the service through a small window. It was most likely in this chapel that King Richard II made the earl of Northumberland swear on a consecrated host that the king would come to no harm if he went to meet Henry Bolingbroke, who was very soon afterwards to become King Henry IV… I couldn’t help wondering if King Richard watched this act of perjury from the watching room, or if he deigned to enter the chapel in person for the occasion. 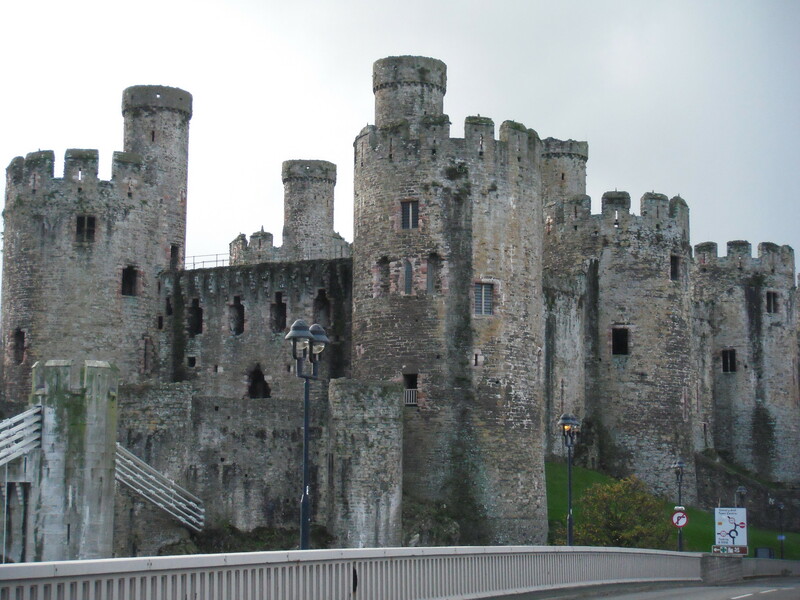 Supposedly, when he arrived at Conwy on his flight through Wales, he found it extremely ill prepared to receive him and he and his courtiers were forced to sleep on straw. The castle is extremely well defended thanks both to the natural surroundings of sea and mountains and to the city wall, which extends uphill from the castle and encloses the town. 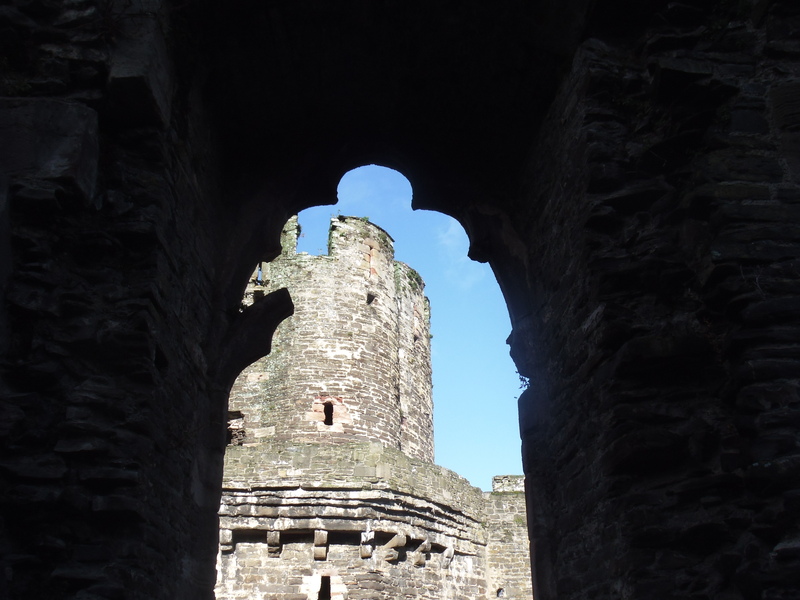 Back in the 14th and 15th centuries, native Welsh people weren’t allowed to live inside the city wall, so it must have been extremely traumatic for the English inhabitants when the Tudor brothers captured the castle during the Welsh nationalist rebellion of the early 1400s. 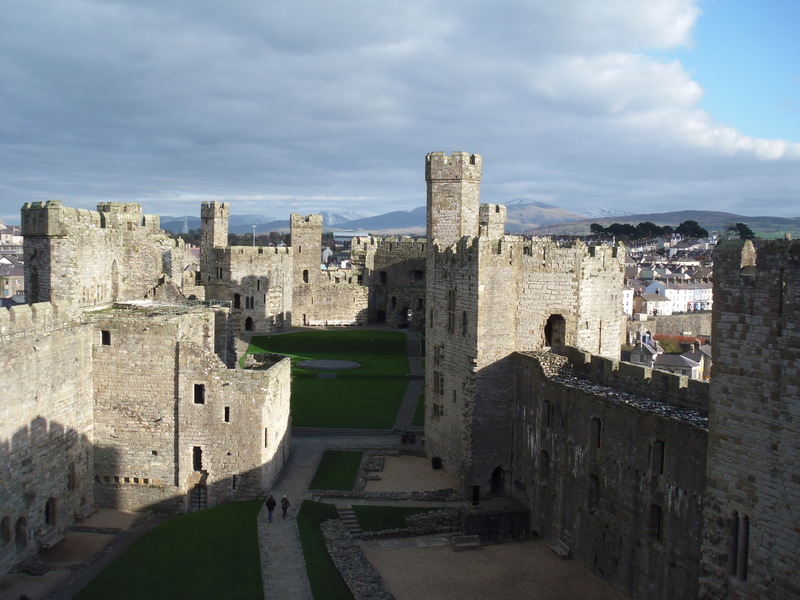 They weren’t able to withstand the siege laid by Harry Percy, aka Hotspur, the hometown hero of Alnwick, however, and Conwy was back in English hands within a few months. 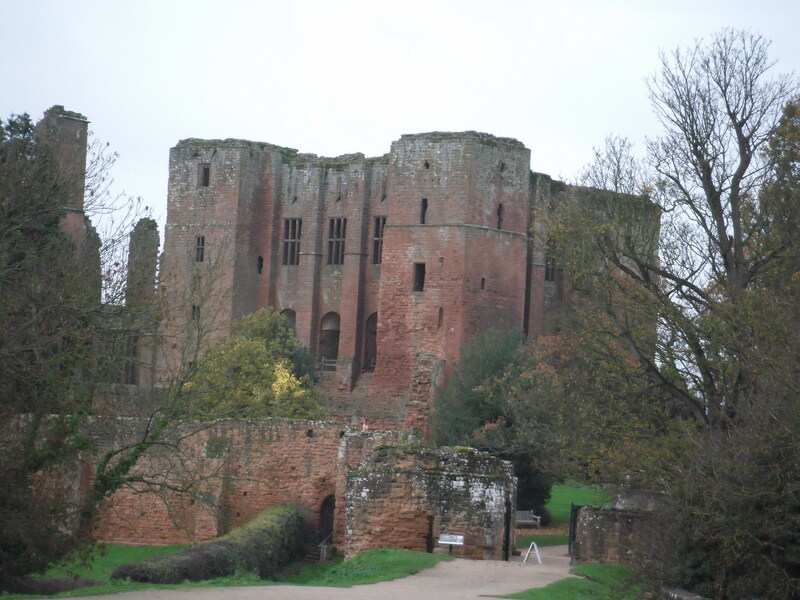 Subsequently the townspeople sued the crown for losses amounting to £5000 for destruction of the walls and houses, which they claimed had been entirely destroyed, plus £10000 for destruction of town records. I think they might have done better to sue their lawyer for malpractice – what court would ever believe records were worth twice the value of walls and buildings? 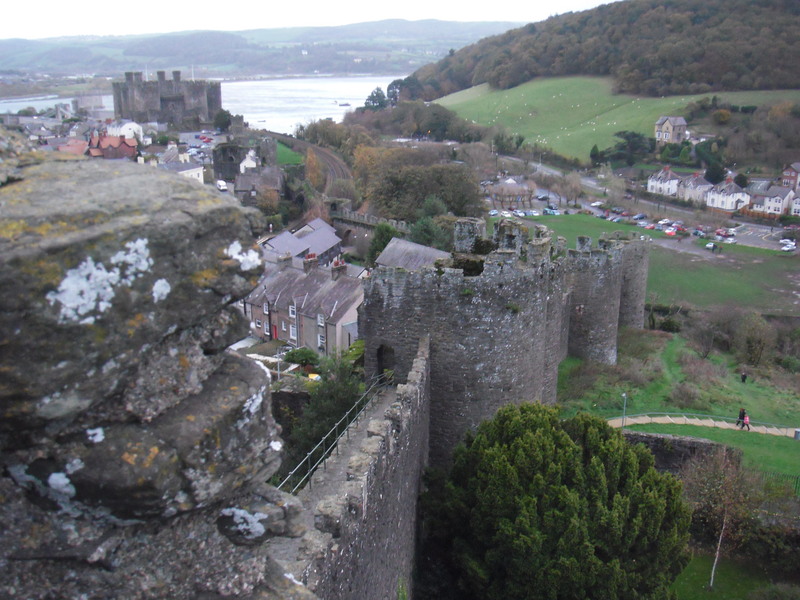 Fortunately, Conwy Castle and its walls are still standing, and they’re very well worth a visit. Of the three castles I visited in North Wales, this one is my top pick. If you ever get the chance to go, do it! Fountains Abbey is one of the best places I’ve been so far this trip. 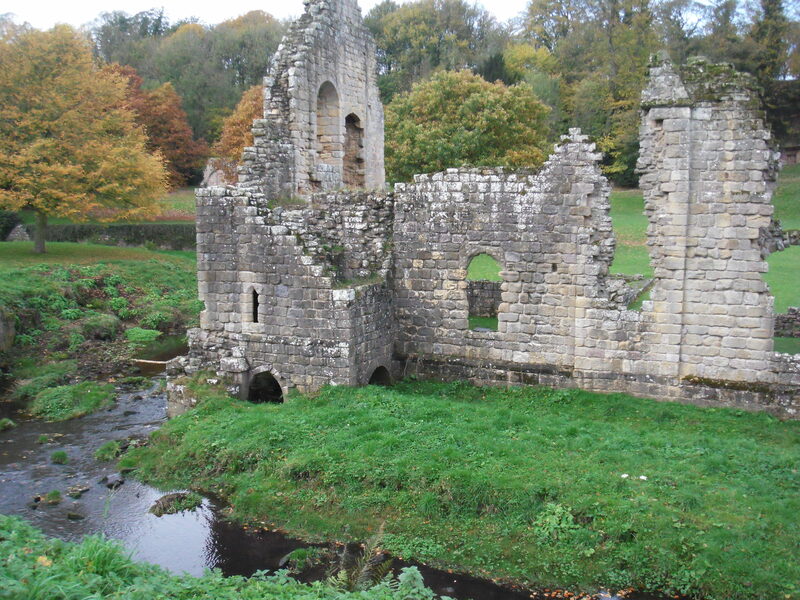 It’s a little hard to reach – from York, I took a bus to Ripon, about half an hour away, and from Ripon I walked the two or three miles to the abbey ruins. In season there’s a bus, but the service ends at the end of November, so I was on my own. Luckily there’s a quiet footpath through the fields, so you can avoid the main road – but it’s not clearly marked, so it’s best to ask someone how to find it. The abbey was built beginning in the 12th century by a group of Benedictine monks dissatisfied with the laxity of life at St. Mary’s Abbey in York. 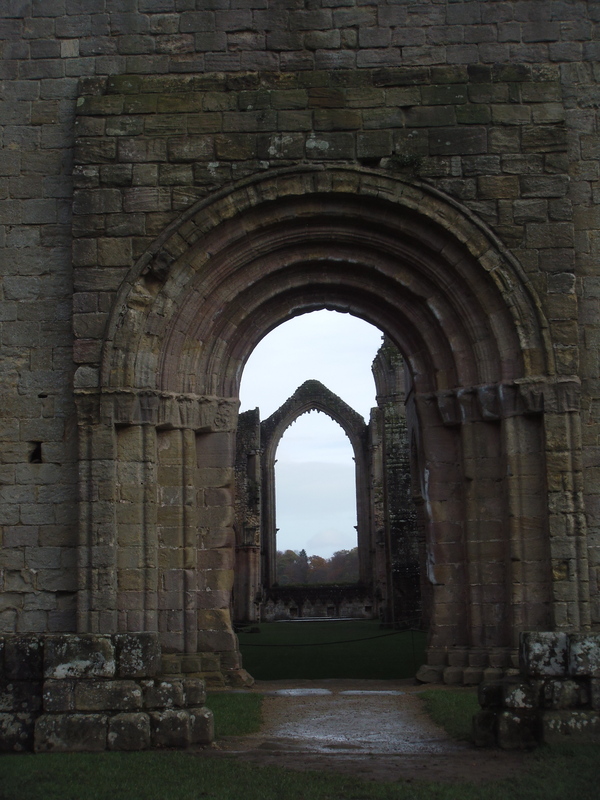 They were granted their own land and became Cistercian, but over time the abbey became more wealthy and the monks probably became more lax. 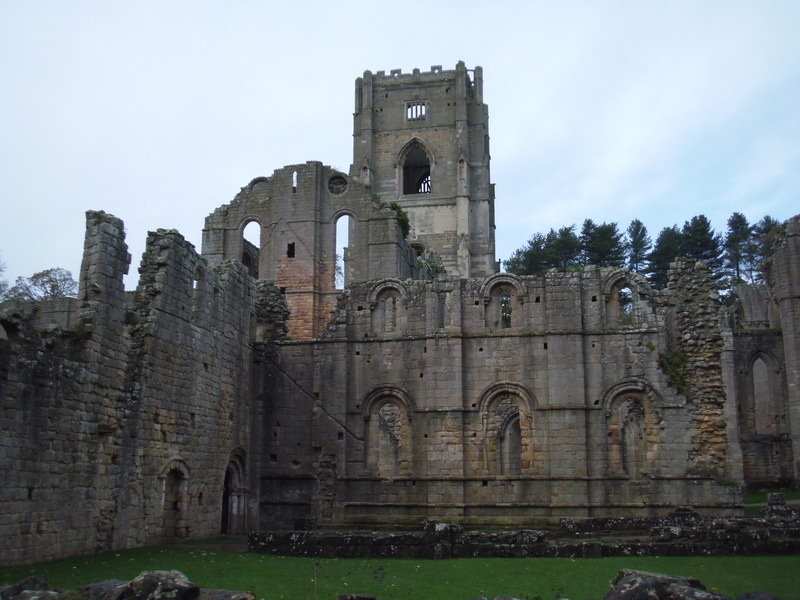 The abbey certainly was built on a grand scale, with its tower on the end of the north transept and its small village of outbuildings, including two guest houses and a hospital. 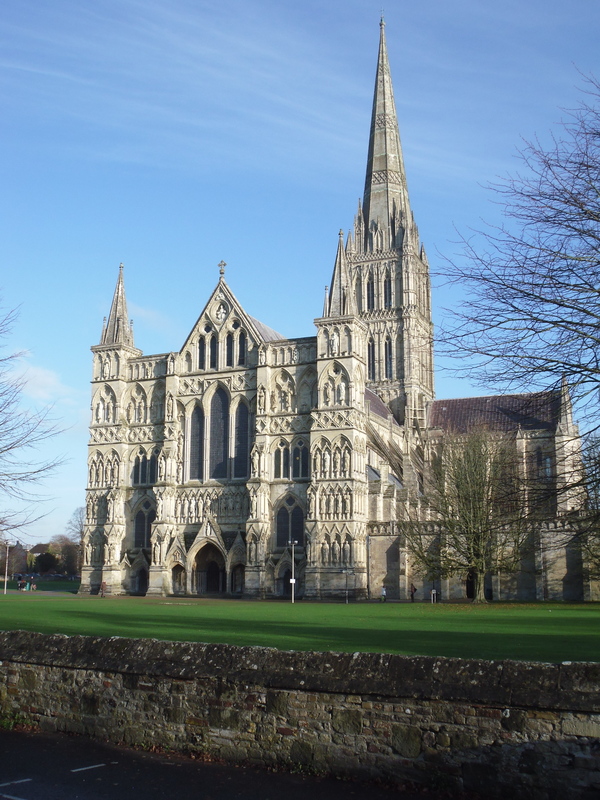 There would have been a large number of lay brothers as well as the monks in residence. The living quarters and cellars are built right over the stream, which was used for drainage. Built of pink and orange marbled sandstone, the abbey is perhaps even more beautiful as a ruin than it would have been before its dissolution and destruction under Henry VIII. 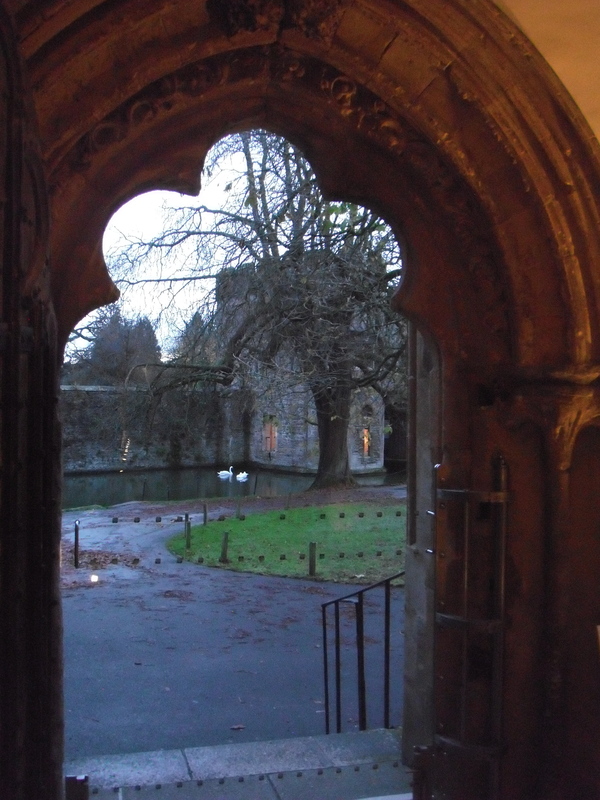 The east and west windows have lost all their tracery, allowing the view above straight through the Norman arch of the west doorway through the nave and chancel and out the east window to the parkland beyond. The warming house, refectory, dormitories, and cloisters are in various states of disrepair – you can still see the two walk-in-closet-sized fireplaces in the warming house, but the monks’ living quarters are reduced to their foundations. 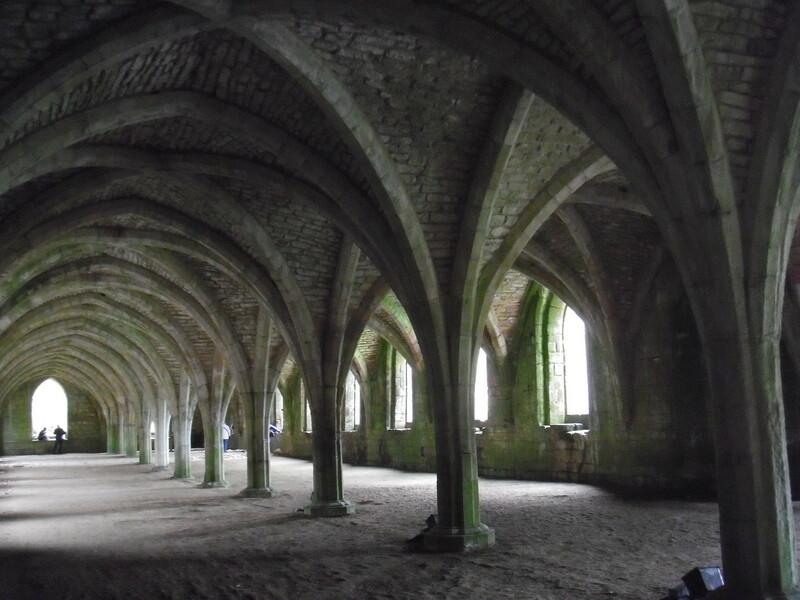 The best-preserved part of the abbey ruins are the cellars, a vast space of vaults and columns, impressive both for its scale and for its uniformity. The land around Fountains Abbey became part of an Elizabethan manor called Studley Royal after the dissolution, and over the centuries the stream was shaped into 18th-century manicured lakes and the forests were converted to a deer park. 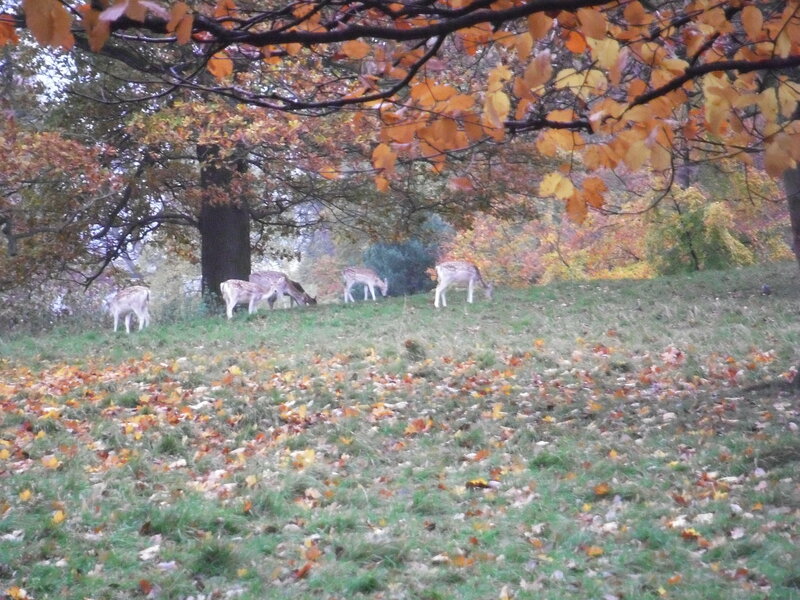 There were lots of deer in evidence as I walked through the park on my way back to the footpath. Because the bus back to York from Ripon came only once an hour, I had a little time to look around the town. 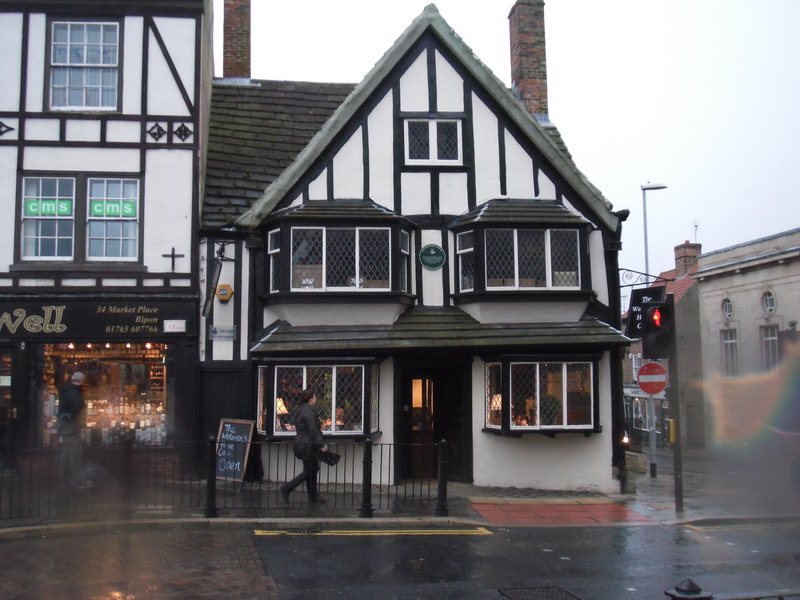 It’s small, but has a cathedral and a wide open square, at one end of which is the Wakeman’s House, a tea room and cafe in the historic 16th-century building where the man responsible for keeping the peace after the town bells had struck curfew possibly lived. Inside it was cozy and bustling, and despite the tempting array of cakes in the counter case I ordered a cream tea. 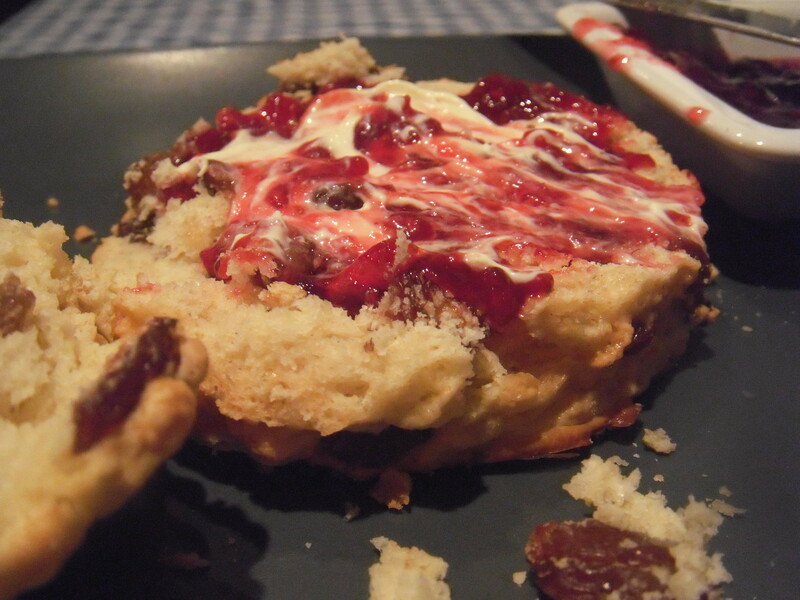 It was served on very modern square dishes, but the scone with jam and clotted cream was perfectly traditional. The proprietress was chatting the whole time with other customers, presumably regulars who live in town. It seemed like a really nice and friendly place, and I wished I could become a regular, too. 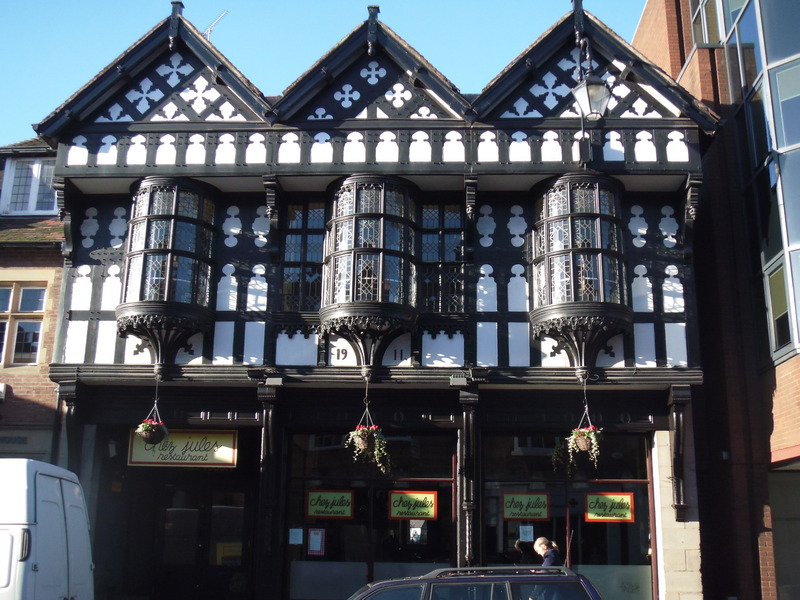 What could be more iconic of merry olde England than black and white timbered buildings? 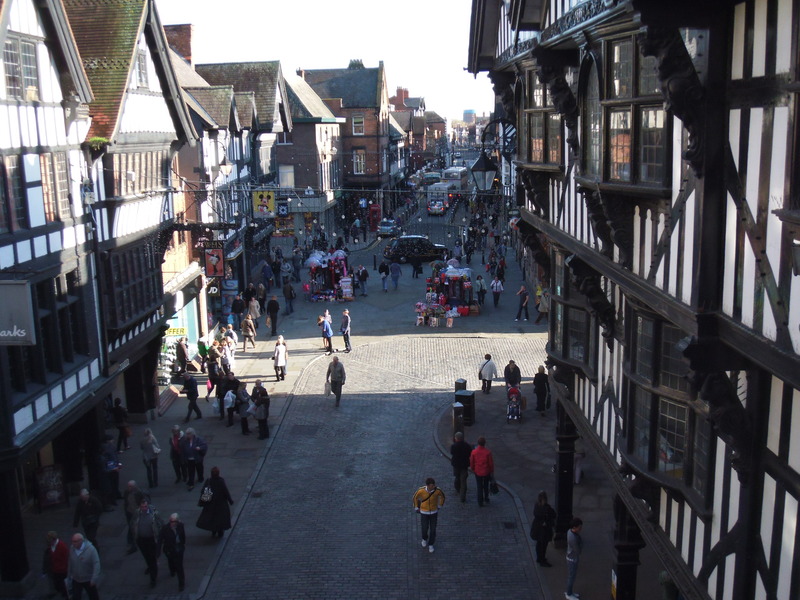 I have to admit that I was drawn to stay in Chester by pictures online and in guidebooks that looked very much like the ones above and below. The streets of Chester’s city centre have timbers cut into gingerbread shapes, crosses, hearts, diamonds, spades, quatrefoils, x’s and o’s. 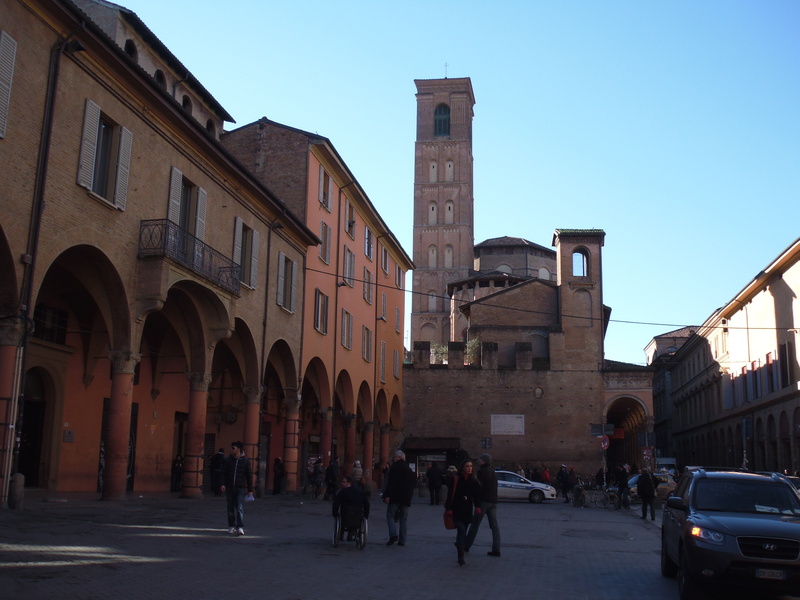 A few of the buildings are the bulging and wobbly fifteenth or sixteenth century originals, but most are Victorian or early twentieth century rebuilds. I have to admit, it didn’t take long before I was sick of them. It felt like Disney World but with chain department stores and coffee shops instead of souvenir kiosks – which are mercifully few, especially compared to York and Edinburgh. For all its kitschy architecture, Chester really is a living city, and old people, uniformed schoolkids, and multiply-pierced teenagers are all plentiful, shopping and catching buses, talking on cell phones and getting coffee with friends. 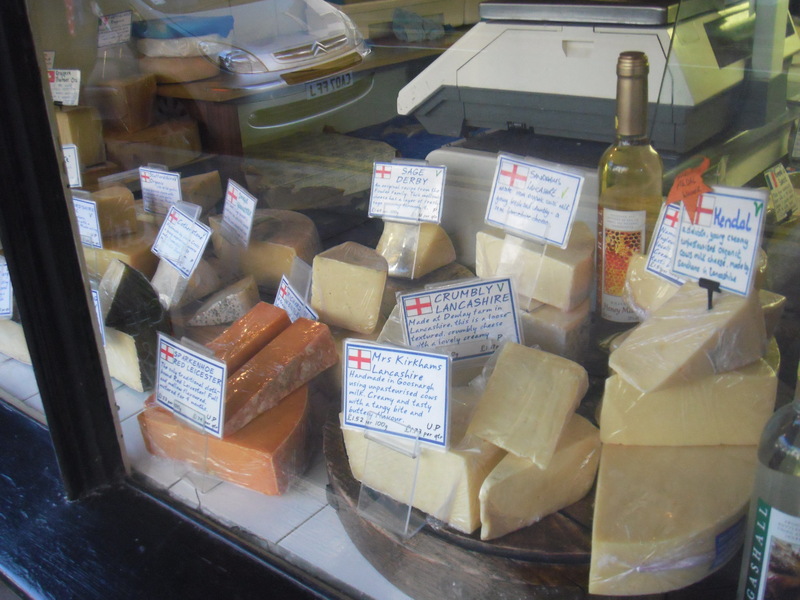 There seem to be lots of nice restaurants and cafes, and though I didn’t try many of them, I did buy a chunk of local Cheddar cheese from The Cheese Shop, close to North Gate. 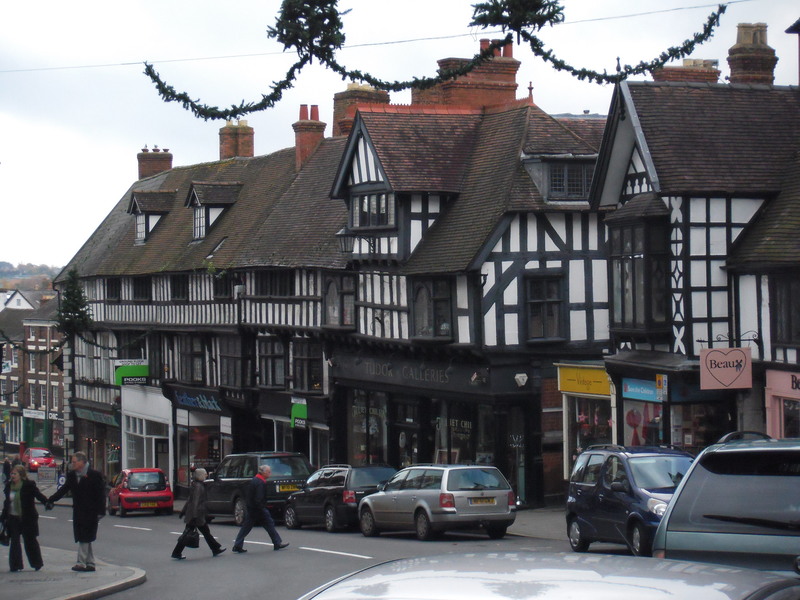 Shrewsbury, pictured below, is another black and white town about an hour south of Chester by train. 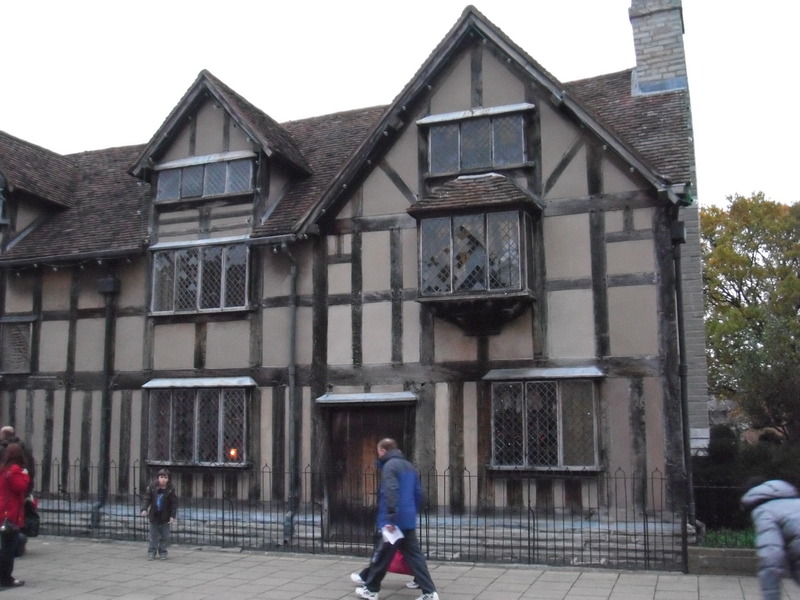 Its buildings haven’t been so drastically straightened and touched up – the timbers are often left brown rather than painted black, and many of its buildings lean. I found it much more appealing, even though I was there on a Sunday when nearly everything was closed. It’s more hilly than Chester, the streets are windy and narrower, and the river is wider and lined with willows. Though its appearance is probably just as much the Victorians’ doing, it has a more authentically old-world-charming atmosphere. 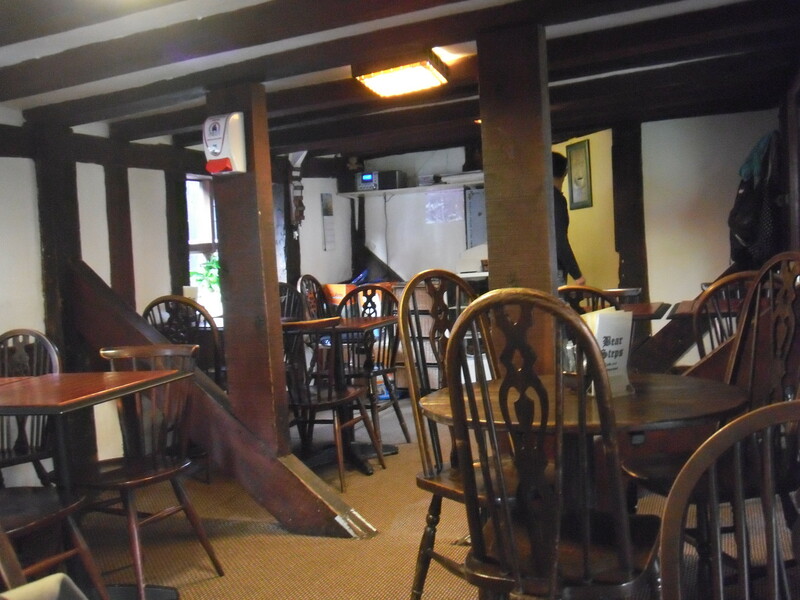 I had lunch inside one of those tipsy timbered buildings, in a cafe near the Bear Steps. 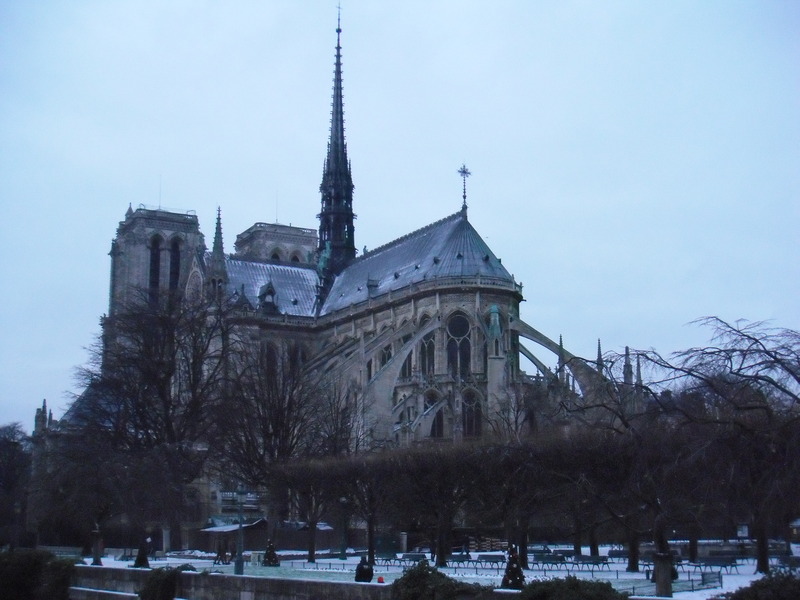 Its sloped roof and creaky floor looked as if they could have been four or five centuries old, but the waitress told me it actually burned down and was rebuilt about 200 years ago. She said this apologetically, as if it had been built yesterday. At the Bear Steps I feasted on cheese once again (I seem to be doing that a lot, this trip). 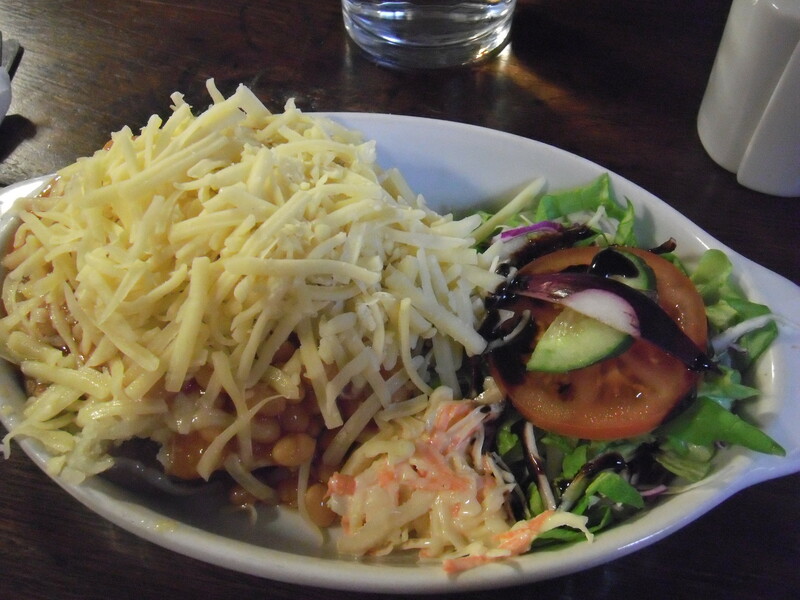 The cheese, which I think was a generic Mature Cheddar, came with salad, cole slaw, and, somewhere buried far beneath, a jacket potato. It was quite tasty, and set me up for another few hours’ wandering among the timbers.